Oakleigh - View looking north with the Oakleigh shelter sitting between the mainline on the right and the 240' siding on the left. The milk platform is in the foreground. The photographer is standing on Oakleigh Road and Cromwell Bridge Road is off the photo to the left. Photo source: M&PRR files - Insurance Photo- February, 1940. Maryland and Pennsylvania RR timetables listed the station as Number 9 from March 1, 1915 until January 1, 1926, when it was designated station Number 10. The station, located 9.6 miles north of Baltimore and 67.6 miles south of York, was alternately called Cowpens throughout its early history. Situated along Cromwell Bridge Road, the Oakleigh Station area was characterized by a minimum of structures and did not serve any industries. A passenger shelter stood railroad west of the mainline and just north of Oakleigh Road. In its first iteration the shelter was described as a 10' x 18' frame shed with a wood platform. It was destroyed by a derailed coach in January 1917. The second version of the station was built in 1917 and was a PRR type W3 frame structure sporting a slate roof. Dimensions of the shelter were cited as 12' 6" x 29' with a partition 7' 6" x 19' 0". A W2 type milk platform, 4' x 6', stood south of the shelter and was connected to the shelter by a ground platform, type G1, measuring 5' 0" x 50' 0" with stairs (3 risers at 4' wide) to the milk platform deck. The passenger shelter was torn down on August 12, 1957. 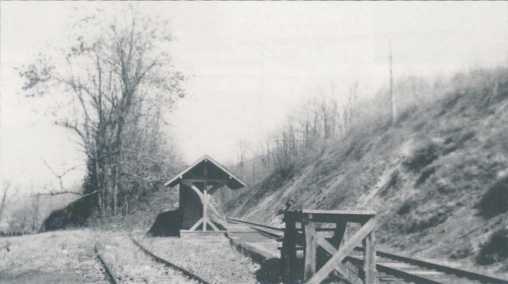 The Oakleigh siding, with a capacity of 3 cars, was installed with a south switch west of the mainline and was 270' long with a clearance of 120'. In 1937 the dimensions indicated were turnout 130' and the team track 140'. January 1, 1941 was the date on AFE No. 675 which stated the removal of side track at Oakleigh - 240'. Thanks: My thanks go to Jerome Murphy and Charles T. Mahan, who from the very beginning pointed me in the right direction. These individuals were joined by Rudy Fischer, Theodore F. Gleichmann, Jr., and C. Stewart Rhine, who also have helped me find my way gathering M&P information and photographs. Also would like to thank anyone who has contributed to my endeavor along the way. Frederick, Gary, Focus On... Oakleigh; TIMETABLE, Vol 22, Number 3, Summer 2006; The Maryland and Pennsylvania Railroad Historical Society, Inc.
© Copyright The Maryland and Pennsylvania Railroad Historical Society, 2007.